The years haven’t mitigated the plethora of wacky suspicions/fabrications. Quite the contrary. Thus Al Jazeera reported last Tuesday that tests at a Swiss lab conducted on Arafat’s purportedly uncontaminated personal items, such as clothing and a toothbrush supplied by his widow, Suha, yielded indications of elevated traces of radioactive Polonium 210. This, it should be noted, is the substance used six years ago to eliminate Russian spy-turned-dissident Alexander Litvinenko in London. The Lausanne lab stressed that nothing can be said for certain without exhuming Arafat’s body, but that is no impediment to innuendo. The Palestinian Authority said it would agree to an exhumation from the Ramallah mausoleum if Suha Arafat requests it. These allegations are hardly new and surfaced hot on the heels of Arafat’s demise at a French military hospital (which did not divulge the cause of death but did note that Arafat’s symptoms were in no way remotely compatible with those of polonium poisoning). The appeal of conjuring nefarious plots persisted and in 2009 became the stuff of intense challenges to Arafat’s successor, Mahmoud Abbas. That was when Fatah co-founder Farouk Kadumi – who brands the two-state solution “just a temporary phase” – showed Al Jazeera TV what he asserted were protocols of a three-way collusion by Abbas, Arafat’s longtime sidekick Muhammad Dahlan and then-prime minister Ariel Sharon to assassinate Arafat. To cleanse himself and counter the politically loaded charges, Abbas recruited Bassam Abu Sharif, Arafat’s consigliore, nicknamed the “Face of Terror.” But Abu Sharif’s tack was hardly to deny the calumny. He merely modified it to place the culpability more squarely on Israel. Tall tales of a plot to murder Arafat are too good to pass up in a setting where fact and fiction are intrinsically indistinguishable. 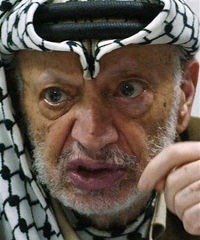 Since no one would anyhow believe Arafat died a natural death, better just blame all foul-play on Israel. In that spirit and with Abbas’s unstinted backing, Abu Sharif claimed he knew for a fact that Israeli agents substituted toxins for medications Arafat was taking. Moreover, the lethal Israeli concoctions were, according to Ramallah’s officially sanctioned version of events, brewed especially for this purpose by a leading Israeli pharmaceutical firm. The convention unanimously demanded an international inquiry into Israel’s role in terminating the Nobel Peace laureate. Mrs. Arafat charged that Israel deliberately contaminated with lethal toxins 80 percent of the water (not 79% or 81%) consumed by Palestinian females and infants (but presumably not by adult males). Clinton uttered no objection. Herein lies the trouble. The failure of the international community to object gives assorted canards legitimacy. Hence Arab masses are convinced that Israel was behind the 9/11 destruction of the Twin Towers. Not only is invaluable energy expended on deception at the expense of tackling real problems, but fantastic convolutions of trumped-up cloak and dagger stories do not bolster the cause of true peace. Falsehoods negate peace. Where the culture of mendacity reigns, trustworthy accords cannot grow. That is why the latest twist in the “Arafat assassination” tale matters. into the portals of Paradise to the reception of 72 ‘chaste’ virgins, his soul will actually be burning forever and ever in that awful and horrible place known as the “Lake of Fire”. Other than that Sarah, have a wonderful and beautiful day. The more you tell a lie, the more it becomes “the truth”. Specifically, any imaginary concocted fable about the Jews in general, and about Israel in particular becomes *the* reality. I don’t know and I don’t care how that person died, I don’t even want to write his name. I wish you all a fine week end. Honig misleads with her conclusions in the last two paragraphs. I propose that within the Muslim culture, the fact that mendacity reigns is secondary to the likelihood that mendacity is in fact intrinsic. The statement that mendacity reigns suggests that a simple majority of these people can change their thought process. I propose that they cannot. Although I may not wish to infer the following comparison, apropos as it may be to bred animals, take for example bred dogs, with my apologies to the species for the comparison. Certain breeds of dogs tend to carry behavioral traits. Some are bred to be nice, others intrinsically violent. Case in point, take Honig’s peripheral example to the point of her article of one Yasser Arafat, one of the many poster children for the followers of Islam. Here we have a result Darwinianly-perfected over the centuries of a pathological liar. Anything evil thing that he himself had done or propagated into final result, would he then blame on Israel. He celebrated and paid for the suicide bombings of Israeli populations including but not limited to Israeli men, women and children, then whines that the IDF is operating in “civilian” areas of precious Gaza were no member of any terrorist group dare stand out in appearance from anyone within the general population, the vast majority of which are terrorist-minded with malicious intent. Not so? Well they did vote for Hamas and by vast majority. As such, the general population is as guilty as any bomb-carrying Shahid nut-job. And it starts with the children who are perverted from the age when they can first learn. Anyone who goes against the grain and has a properly functioning brain goes down the drain. They are murdered or worse and seldom reproduce, with at best a fifty percent chance of success. No, the problem with the followers of Islam is not that mendacity just reigns, and that somehow the populations of the Islamic world might grow out of it. Rather from the symbiotic attractions of the nature of Islam itself, they have fully have grown into it, and the mendacity is now intrinsic to the populace, a very real part of the DNA itself instructing the formation and function of their brains. Low IQ the rule? Not so quick. Don’t forget the history and nature of Islamic slavery both in Europe and especially along the coastal regions from Islamic pirates, and operations in the former Byzantine Empire. Just as that area was attacked by its own children as the Janissaries, so we are often at war with the IQ of our own DNA stolen against our will long ago. At times we are literally fighting a highly intelligent version, perverted, of ourselves. The problem with the followers of Islam is inextricably intertwined. My Rabbi once told me, “When you can’t tell the truth, anything goes.” In many places in the Muslim middle east, the truth isn’t worth much, except to get the bearer killed. History is chock full of people drawing wrong conclusions from any given situation; i.e., fewer Jews died in the 14th century bubonic plague–therefore, they must have caused it. However, Hillary Clinton bears part of the blame here–she never lets a big lie go to waste. Along with her boss, Barack Obama, she has heavily contributed to a politically and socially poisoned atmosphere in the United States; where the truth is often radioactive. What is the remedy? The Arabs and all Muzzies are the sons (and daughters) of lies…I really cannot recall a single episode, in which these people would not have twisted the truth or preferred the truth compared to a lie…The father of Mohammad Atta denied his sons role in the 9/11 attacks and at the same moment bristled with pride about his sons wonderful deed ! Great to have you back Sarah !!! Israel lost any hard won deterrence long ago by reverting to the actions of the cowardly ,retreating appeasing loser whom everyone piles on with ease to attack at will. I do wonder when Israel will return to their roots ? “We made a serious mistake in allowing Arafat to come here from Tunisia to murder our citizens and we have dispatched him with no apologies. It’s too bad Israel has no strong leaders,only apologists and feeble wimps who can stand up to the hypocrite nations and tell them to drop dead when it comes to defending the people. That will have to change…….soon ! By the way Sarah, where did you get that picture of Arafat…? Huhuhuhuhu!!!!!!!!!!!!!!!!!!!! It is sooo awful !